This leather belt keeper is a handy way to secure an item to a belt. Santa's belt slips through the upper sewn loop. The lower loop is unsnapped, slipped around a suitable item, and then is snapped closed. Click "See more images" to see how the belt keeper would work to hold a set of Santa's hand bells. The belt loop part of the keeper is sized to fit your belt, up to 4" wide. 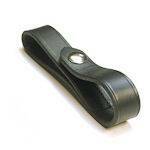 The snapped loop is sized to hold an item roughly 1 inch wide and 1/2 inch thick, as shown. If you need the snapped loop to be bigger, please explain in the notes section below. Made with high quality bridle or harness leather and a solid brass snap in your choice of color. Sold per each. Santa's hand bells (the red ring with silver bells) is not included -- this product listing is for just the belt keeper alone.